I came across the call to 'https://mail.domain.com/EWS/mrsproxy.svc failed error while trying to move a mailbox from Exchange on-premise to Office 365. While the first line of the error message suggests a network connectivity issue in reaching my EWS endpoint, the full error message gave the bigger picture. Error: The call to 'https://mail.domain.com/EWS/mrsproxy.svc' failed. Error details: The HTTP request is unauthorized with client authentication scheme 'Negotiate'. The authentication header received from the server was 'Negotiate,NTLM'. --> The remote server returned an error: (401) Unauthorized.. --> The HTTP request is unauthorized with client authentication scheme 'Negotiate'. The authentication header received from the server was 'Negotiate,NTLM'. --> The remote server returned an error: (401) Unauthorized. As it says in the error above, the server is treating it as an unauthorized connection, which lead me to the permissions. The issue was that the password for the account that was used in the migration endpoint was changed. I have seen instances where this kind of account gets disabled as part of the weekly maintenance scripts. The steps to fixing the issue is as follows. Reset the password for the account used in setting up the migration endpoint (complex password ofcourse) and set it to never expire. Login to the Office 365 portal and head to the Exchange Admin Centre. 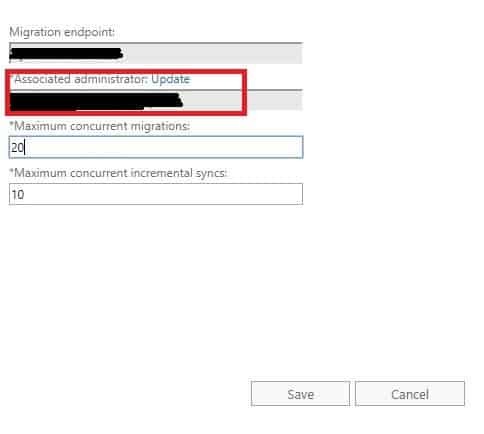 Navigate to the 'Migration' tab and click on the "..." to bring up the Migration Endpoints. Once the migration endpoint was updated, the mailbox move to Office 365 was successful.